This Saturday is May 1st and yet it is snowing as I write this. Ahhhh, spring in eastern Oregon! Concetta DeNaro Whitworth, author of Papa's Pantry- The Art of Cooking Italian will be our featured guest for our Saturday event this week. She'll be autographing books, sharing her homemade biscotti (her dad's recipe of course!) and telling great stories about growing up in a Boston home with a real Italian chef for a father. BELLA will be pouring the Moscato d'Asti from Cascina Castlet and the amazing (and incredibly lovable) Elio Perrone Bigaro. Try to stop by and join us SATURDAY, MAY 1st from noon until 3pm. 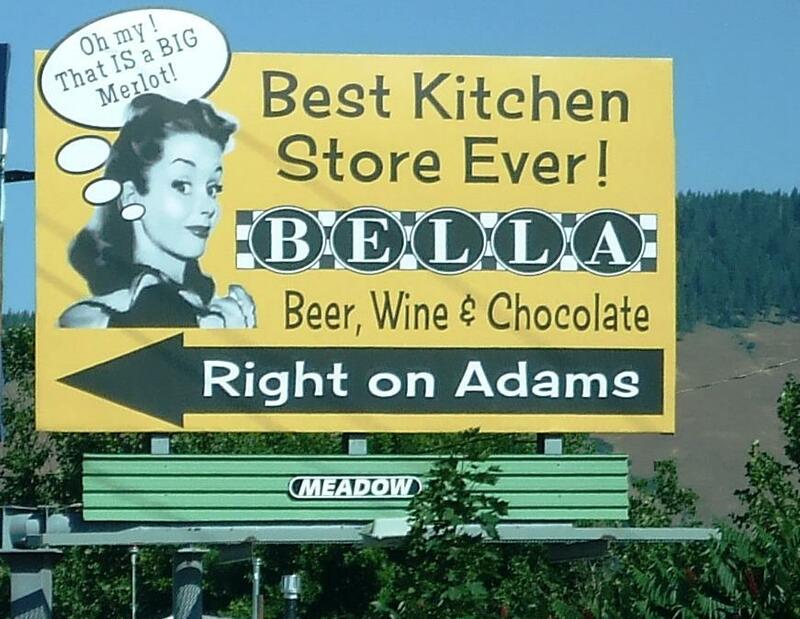 The new BELLA La Grande is open Monday through Saturday, 11 'til 7 each day and we always offer wine tasting but feature special guests and demonstrations every Saturday at noon! The first few weeks of BELLA have been magical and I'm having such fun with the new store. Elizabeth Martin-Calder stopped by last week (we missed spending our birthday together last month) and we had an impromptu party-of-sorts before BELLA opened with the Dufflet bittersweet chocolate and almond Feuille Croquante and a 2005 Banneret Chateauneuf du Pape- it was worth waiting to celebrate! She's the director of the Walla Walla Wine Alliance and has spent the past 5 years watching that valley just explode with great wineries and it's a major perk having such a good friend on the "inside" to help me discover the newest and most exciting wines from our neighbors across the Blue Mountains. Speaking of.... Elizabeth introduced me to Greg, the founder of Grammercy Cellars at a Walla Walla wineries event in NYC last year and we have finally hooked up and will be receiving his amazing Syrah on Monday, May 3rd! The Lagniappe Syrah absolutely wowed me at that event, the same event where I confirmed my true belief that John Abbot, the winemaker of Abeja, makes the best American Chardonnay, bar none! Greg Harrington is the youngest American to ever receive his Master Sommelier and he worked with chefs named Emeril and Wolfgang (perhaps you've heard of them?) before moving to Walla Walla to start a vineyard with his wife Pam. We're lucky he left Manhattan for our neck of the woods and I'm excited to add his wines to our selection in both stores! Last night as I began my closing routine, I was doing my usual 7:15 pm-what-am-I-going-to-cook-cruise around the store and I landed on the Palacious Chorizo. I've loved the regular but decided it was time to try out the HOT Chorizo and here's what I came up with... it was absolutely divine!! Heat large saute pan, melt oil and add onions. Cook until transparent and slightly caramelized. Add chorizo and cook 2 minutes until onions take on the rich coloring of the sausage. Add beans, lemon rind and stir well. Make well in the center of the pan and add the couscous and vegetable paste, stir well and then add water. Lower heat, cover pan and cook for 15-20 minutes. Stir the beans and couscous mixture, taste for seasoning and add Harissa, sea salt and pepper to taste. Cover for another minute and serve with crusty ciabbatta bread and Gloriosa Tempranillo. And now for the Jelly Bean story... this past Friday there were several people in the new store and I noticed a young man, about 10 or 11 that seemed to be on his own. He walked through the entire store and seemed to be looking at everything! After 20 minutes or so, everyone else had found what they were looking for and had left the store. He walked up to the butcher block counter, flipped his bangs to the side a bit (they were very stylishly long and covering his eyes) and reached into the pocket of his jacket. He pulled out a Ziploc bag bursting with pennies and put it in the middle of the counter like someone who has watched every Clint Eastwood spaghetti western and personally knows what the man with no name would do! He looks up and says "I'd like a dollars worth of RED HOT jelly beans please." We counted out the pennies, he had exactly 100 plus a dime. He walked out with his jelly beans and a dime in his pocket and I chuckled for the rest of the day! Great jelly bean story! Sounds like it was a Guido moment.